A surprise to me about the outrageous case of Otto Warmbier’s murder by the North Korean regime is that the 22 year-old college student was Jewish, and proudly so. The organized Jewish community was likely surprised as well. We do not know if North Korea knew he was Jewish, nor if he was victimized specifically for antisemitic reasons. Otto Warmbier, an American student at the University of Virginia—who was active in Hillel and who went on Birthright, . . . —died yesterday after being arrested and tortured by North Korea. You’d think that the cluster of handsomely funded Jewish organizations that fly the banner of promoting and protecting Jewish life in America and abroad would notice and acknowledge Warmbier’s murder. So far, though, American Jewish officialdom has been deafeningly silent. The odious Anne Frank Center, . . . didn’t bother taking a break from bashing Donald Trump to lament a young Jew put to death by the world’s worst offender of human rights. Nor did the ADL, an organization quick to stand up with Linda Sarsour as she denied Jews their right to self-determination but not so swift when the victim was a young Jewish man whose crime was pulling a silly prank at his hotel while on a college tour of a nation that routinely starves, imprisons, and executes hundreds of thousands of its own citizens. 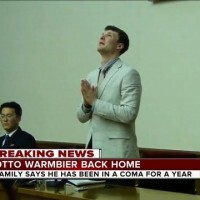 Everywhere you turn today, you hear no one demanding justice for Otto Warmbier. What you do hear are the howls of the social justice brigades, for whom Warmbier, being white and a man, is mostly to blame for his own murder. . . . The young Warmbier’s tragedy is worthy of protest by any American group, Jewish or not, but unless this crime appears to have an antisemitic source, Leibovitz’s ire is misplaced. As is his habit, Leibovitz is but again raging against Jewish groups who support liberal or progressive causes. I share some of his skepticism about people who constantly tout what they see as a progressive agenda, engaged in little beyond rhetoric and symbolism; but criticism only makes sense to me when it’s well-reasoned, and not simply framed as an insult. Leibovitz – to my knowledge, no relation – is guilty of using this tragedy for his own purposes, and it’s a wonder he still is given a free hand to peddle his stuff. Apparently, Warmbier’s own family kept the wrap on his Jewish identity, not wanting to rile the N Korean regime which first called it a church directed plot on the regime [ the kid pulled down a poster]. The rest is balogna.